I really don’t know why it took me two whole years to read the second installment of Steven Erikson’s monumental fantasy sequence, the Malazan Book of the Fallen, because the first volume, Gardens of the Moon, totally blew me away with its epic scope, sophisticated style and complex plotting. I did however read Ian C. Esslemont’s Night of Knives which is set in the same universe and just before the first book so felt it was time to tackle Erikson’s second. Once again the hefty novel (it’s almost 1000 words) did it’s job. It’s hard going and emotionally wrings you dry but it is brilliant. Now I think I’m on some sort of Malazan kick and have the next three lined up. I’ve just started Memories of Ice and once again my mind is awhirl. 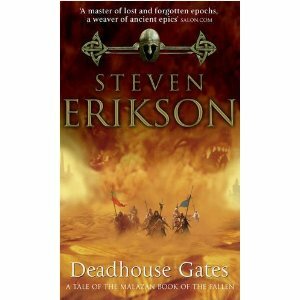 Deadhouse Gates opens with Felisin, youngest daughter of the aristocratic House Paran and sister of Ganoes the Captain of the Bridgeburners (an outlawed Malazan military corps), chained between Baudin, a grizzly warrior, and Heboric, an ex-priest of Fener with no hands. Unfortunately for her, the Empress Laseen, formerly known as Surly, the now-dead Emperor Kellanved’s assassin, has decided to cull the aristocratic houses of the Malazan Empire and Felisin must pay the price, sent as a slave to the Otataral mines for hard labour on the orders of her own sister, the Empress’ Adjunct Tavore. Felisin vows to do everything she can to survive and get her revenge on Tavore and she does so with the help of Baudin and Heboric. Many miles away in the Holy Desert Raraku, rebellion is brewing as the Sha’ik gathers her followers to rise up against the Malazan Empire. Laseen calls back Coltaine, the legendary captain of the Crow, and together with the Malazan Seventh Army tasks him to drive back Sha’ik’s Whirlwind rebellion and prepare for war. Duiker, the Imperial Historian, is charged to observe and witness the events that unfold. At the same time, two Bridgeburners, Fiddler, a sapper, and Kalam, an assassin, are also making their way back towards the heart of the Malazan Empire to kill their Empress. The two are separated as Kalam goes to find the Sha’ik and Fiddler falls in with two ancient beings who have been wandering the world for many millenia. As these events slowly spiral towards each other, there is an unsettling in the Path of Hands as spirits and non-humans travel towards a sorcerous convergence at the Deadhouse Gates. Something is brewing and it’s big. There is so much happening in Deadhouse Gates that it’s virtually impossible to jot down a coherent summary without giving anything away and also not getting bogged down with all the characters and history. I’ve only written the bare bones of a summary that doesn’t really do the book justice. Does Felisin survive? Will the humans who use the sorcery remain unscathed? And what will happen to the non-humans that have been wandering the land looking for salvation? Erikson is a master of tying together the various strands of his story that began in his previous book and he does that admirably. There is a lot of background to this series, but it doesn’t matter that you don’t get it all. You know that it will be revealed at the right time. I just want to talk about it all, but I’d rather you read it yourself:) In some ways, I wish I had re-read Gardens of the Moon before reading this but it would have just taken too long. I’m not such a fan of military or war fiction and Deadhouse Gates really is all about war, but I just couldn’t stop reading it. I’m finally getting why the series is called the Malazan Book of the Fallen because that is what the historian Duiker is doing, writing about the Malazan fighters whether they survive or not. You have to really credit Erikson for writing complex characters which keep you hooked. And what I found most compelling was that you didn’t necessarily have to like these characters but they would have one or two features tucked away within their layered psyche which just shocks you into wanting to know what will happen to them. Another thing I noticed and liked was how strong the female characters were. In fact, there didn’t seem to be much difference between the male and female characters since most of them were fighters or soldiers. Apart from the various human characters in Deadhouse Gates, some of the more fascinating characters are the non-human Tiste Andii, Tiste Edur, the Jaghut, T’lan Imass, etc as well as the gods who have been prowling Erikson’s world for thousands of years. They live on a different timeline to those of the humans and move around in warrens of sorcery. In particular, and very scary, are the Hounds of Shadow. Lovely. I didn’t necessarily find this easy reading, some of the plot twists and storylines made me shudder but there is a real sense of epic history and culture and you just can’t help but get swept away in Erikson’s world. I really cannot wait to continue reading this series. Erikson’s just finished the tenth and last volume of the series, The Crippled God, and will be signing at Forbidden Planet this Saturday at 12:30pm (26th February). Will you be there? ‘Coz I sure will! Ah.. Duiker is such a great character. You’re in for a treat with Memories of Ice, it is my favourite in the series. I really ought to reread it. I read and enjoyed the first book in this series but waited too long to read the second one and then was SO confused… so I may just need to start the series all over again. I also wished I’d re-read the first book so had to go back and find reviews of it (plus wikipedia!) to refresh my memory. I’m going to try not to leave too much time in between the rest although there are SO many volumes!